Wisdom is something that can't be, well, it's never complete. It's something that we have to acquire, and it's safe to say that no one, not even you, will ever completely obtain. Neopia Is Still Full Of Magic! 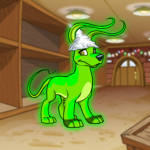 Aisha Aisha - Happy Birthday Neopets! What's with the stupid Slorg cookies? Gather some friends and get ready. This birthday celebration is sure to top them all! Glamorous, meticulous and unfortunately easy to beat at Cheat! – ladies and gentlemen, it's Capara.